As is usually the case, summer seems to have gone far too quickly, but in the case of many with COPD, fall cannot come quickly enough. While the changing of the seasons offers cooler temperatures, making it easier to breathe, it also offers challenges. Allergies impact an estimated 35 million Americans, and can greatly affect those with COPD. There are three seasonal allergy periods throughout the year. In spring, pollen from trees can cause allergic responses, while in summer the culprit is often grass pollen. From late summer to late fall (however in warmer areas the season could last the entire winter), weeds pollinate and become a large producer of inhaled allergens along with mold spores. The most notable contributor is the ragweed. 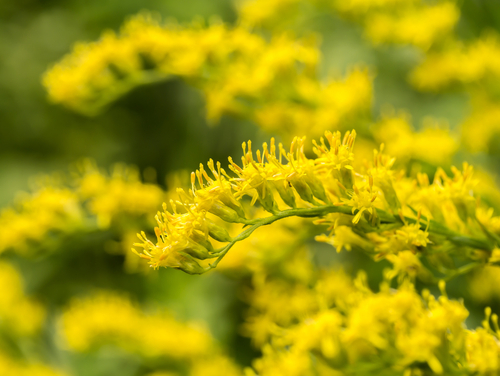 Ragweed primarily grows east of the Rocky Mountains and is the largest contributor to fall allergy problems. A single plant may produce a billion grains of pollen, and that pollen can remain in the air for long periods of time and travel several hundred miles. Mold spores develop in autumn and are found in the soil and in the leaves that fall to the ground. Mold spores are easily inhaled, and tend to rise in the morning and fall back to the ground as evening temperatures cool. For people with already compromised lungs susceptible to seasonal allergies, breathing airborne allergens can greatly complicate their breathing and often require medical treatment. So, what can you do? If you are out in the early morning wear a facemask. If you are out during a period of high pollen count wash exposed areas of your body including your hair. You should immediately remove and wash exposed clothing so the allergens aren’t spread through your house. Try to have leaves removed quickly after they fall (and if you are the one doing the raking, wear a mask). Clean or replace your furnace filters frequently and use air conditioning instead of opening windows during high pollen periods. You might also consider purchasing a good quality air cleaner for your house or the rooms you frequent most often (never use one that produces ions). Interestingly enough, during an allergy season, your car can aggravate your symptoms. You should always open your car windows for a few minutes before turning on the car’s heat and air conditioning to remove any allergens that have collected in the cars air filters. Avoid being outside during windy days. Before you go out, check the air quality on sites such as https://airnow.gov/ or the National Allergy Bureau http://www.aaaai.org/global/nab-pollen-counts to determine the air quality. You should discuss with your doctor any seasonal allergy problems you might experience to determine if you might benefit from prescription medication or whether you should use your inhaler more often. Fall is a beautiful time of the year, and with proper precautions, and as long as you follow a few simple precautions, there is no reason you can’t enjoy the beautiful colors and cooler temperatures.